Radiology is a critical component of most medical care. As a consequence of this, legal cases in which individuals are claiming injuries will frequently have imaging studies as a central aspect of the record. Demonstrative evidence can be used as an important instrument in helping to lay the proper foundation for creating a compelling and memorable argument in the presentation of a legal case. Demonstrative evidence is evidence in the form of a representation of an object that helps to illustrate a concept or assist an expert witness' testimony. This is as opposed to real evidence, testimony, or other forms of evidence used at trial. In order for demonstrative evidence to be admissible, certain factors must be adhered to. Federal rule of evidence number 702 states that if "scientific, technical, or other specialized knowledge will help the trier of fact, a witness qualified as an expert may testify thereto in the form of an opinion or otherwise if the testimony is based upon sufficient facts or data, or if the testimony is the product of reliable principles and methods, or if the witness has applied the principles and methods reliably to the facts of the case." The scientific basis of testimony is founded upon principles resulting from the case of Daubert v Merrell Dow Pharmaceuticals, which held that scientifically valid arguments may be used in court, but only if those arguments have been tested, reviewed or are generally accepted. In order for evidence to be admitted, it must be considered by the court to be relevant. Federal rule of evidence number 401 states that evidence is considered to be relevant if it has "any tendency to make the existence of any fact that is of consequence to the determination of the action more probable or less probable than it would be without the evidence". Expert witnesses are confronted with a difficult task of clarifying complex medical information to a jury of laypersons, while juries are confronted with the difficult task of understanding and retaining information with which they have no common experience. Expert witnesses may make effective use of demonstrative evidence in presenting their positions to the jury or trier of fact. Various types of demonstrative evidence can be used and include documents, photographs, imaging studies, charts or graphs, videos, animations or models. An important purpose of an expert witness in the courtroom is to teach the jury and to interpret the facts. In legal cases involving medical issues, displays of imaging data facilitate the task of teaching by presenting visual representations of the relevant findings. Radiology, in particular, lends itself to courtroom presentations by virtue of its photographic qualities. Individuals learn through a variety of sensory inputs. It has been shown that some people learn better through auditory, others through visual, or others through kinesthetic means. It has also been shown that the more sensory modalities that are used to process information, the more retention there is in learning given material. Radiology, as a branch of Medicine, is itself especially arcane, even to non-radiological physicians. It is abstract, unfamiliar, and outside the realm of common experience of most individuals. Additionally however, it is graphic, pictorial, and therefore concrete. Because of these features it lends itself extremely well to presentation as a demonstrative evidence exhibit. Aphorisms such as "seeing is believing", "a picture is worth 1000 words", and "every picture tells a story", attest to the grounding that people have in accepting and validating pictorial information. How does Demonstrative Evidence Assist? Visual aids empower the jury by allowing them to draw their own conclusions. Converting words to images makes them come alive. Demonstrative evidence increases juror engagement. Graphic presentations help in informational retention. Demonstrative evidence may leave the courtroom and accompany the jury to the deliberation room, where it can serve as a reference in decision making. Presentations designed to educate the jury are best developed by the radiologist. A radiologist is able to make educated selection of the images that are more than just simply documentation or display. Findings can be distilled in a relevant and cogent visual format, and can be presented with the necessary medical background. Findings can be highlighted, clarified, and placed in an intelligible context of normal versus abnormal, pathologic versus non-pathologic, and significant versus incidental, so that people with no familiarity with such information can grasp the material. Ultimately the goal is to simplify and make understandable highly complicated and complex technical information, at the same time ensuring that the representations accurately reflect the truth in the case. Pertinent images must be isolated and presented in a manner that can be grasped by lay jurors with no understanding of the technology, or frame of reference to the spectrum of normal and abnormal. This can be facilitated by judicious selection of the relevant images, focusing in on the areas of interest, and color coding and annotating the images (Fig. 1-3). Displays can be rendered in either hard-copy, "storyboard" format, or can be provided as digital data that can be enlarged into large poster sized blow-ups, or inserted into powerpoint presentations. In some instances, it is possible to create three-dimensional images of certain studies, and it is also possible to create video displays that rotate and move the images in a manner that is visually informative and appealing. Such distillations of complicated imaging information into memorable graphic interpretation that have relevance to a jury of laypersons, and that remain scientifically true to the evidence, has been instrumental in obtaining successful outcomes in the vast majority of cases in which such material has been provided to counsel. The radiologist, because of his/her specialized training, knowledge, and experience, is qualified to be both an expert witness, and is also uniquely positioned to help provide the demonstrative evidence, which is a central part of many medico-legal cases. Figure 1: An individual in a Motor vehicle accident claiming a disc herniation and an annular tear as a result of the accident. The pre-accident images show an annular bulge with an annular tear that was unchanged on several sets of images obtained after the accident itself. 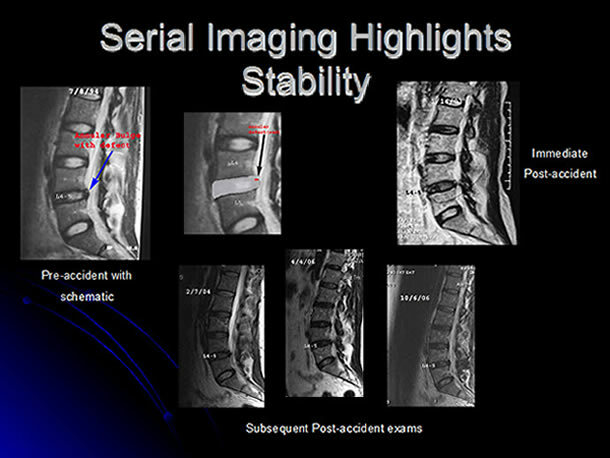 Despite the claim, there was no anatomic difference in the pre- and post- accident images. Fig 2: Illustrative exhibit of a newborn infant with intracranial findings incurred as a result of a perinatal anoxic episode. 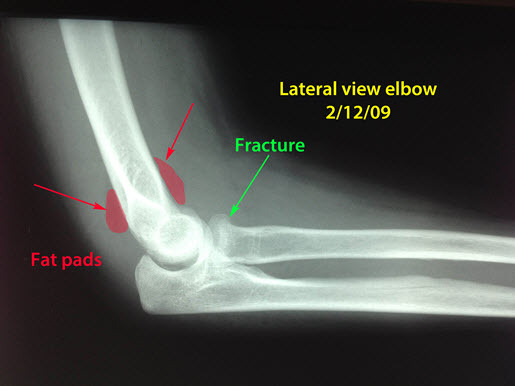 Fig 3: A subtle fracture of the head of the radius bone in the forearm is present (green arrow). The prominent fat pads (red) are usually seen in the setting of the accompanying elbow effusion, which is another indirect sign that a fracture is present. Dr. Marc Glickstein, MD, FACR is a partner in a large private practice radiology group, on the senior medical staff of 8 area hospitals, and an assistant clinical professor of Radiology at University of CT School of Medicine. 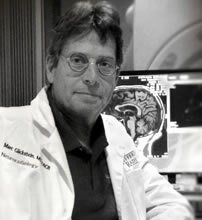 He has over 27 years of active clinical involvement in Neuroradiology, as well as General Radiology including MRI, Mammography, CT, and Ultrasound.